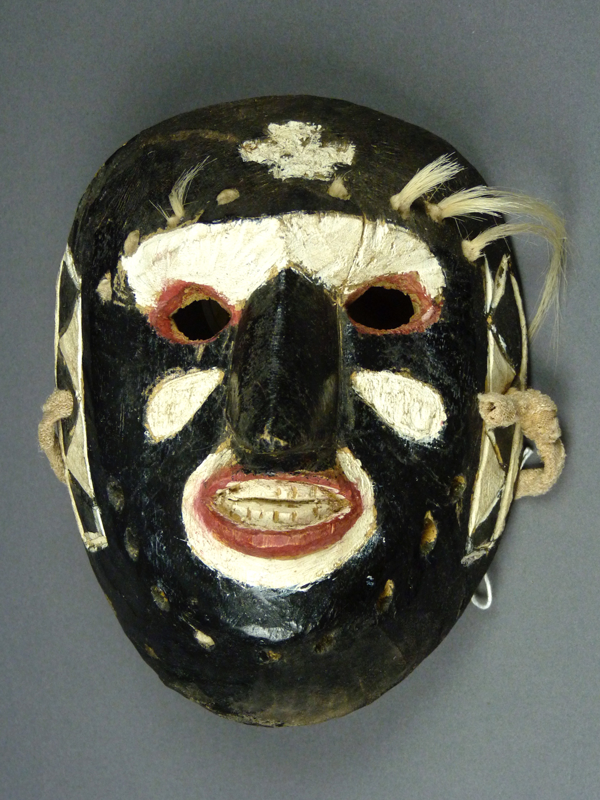 Today we will examine four more beautiful old masks that were carved by Francisco “Pancho” Parra. I photographed the first three in the collection of Jerry Collings in 2011, and he kindly gave me permission to publish them as I wished. It is my understanding that those three may have been later traded to the Gallery West in Tucson Arizona. The first of these was collected from Eduardo Valenzuela of El Rodeo, Sonora, who said it was made in about 1963. Let’s take a moment to characterize this classic Pancho Parra nose. Pancho’s noses often have the profile we see in the photo that follows—a steep curve, ending in a pointed nose tip, and with a crowned taper from the soft central edge of the nasal ridge back to a broader base (about 1 inch maximum width at the level of the face). Other noses by Pancho have an even milder sagging curve so that they seem nearly flat. 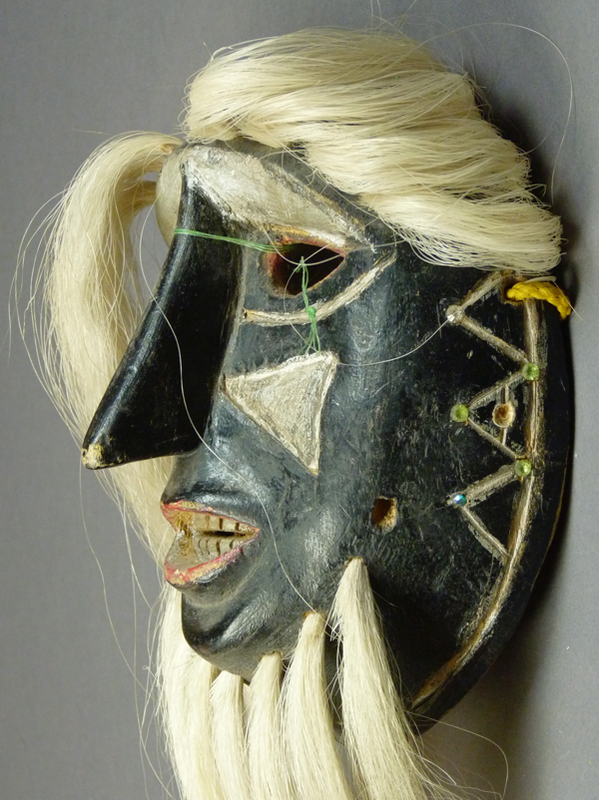 We will examine masks by other Mayo carvers that have a somewhat similar profile in the side view, but with obvious differences to alert us that they were not carved by Pancho Parra, such as more dramatic curves, snub noses, and more block like or rod like shapes. 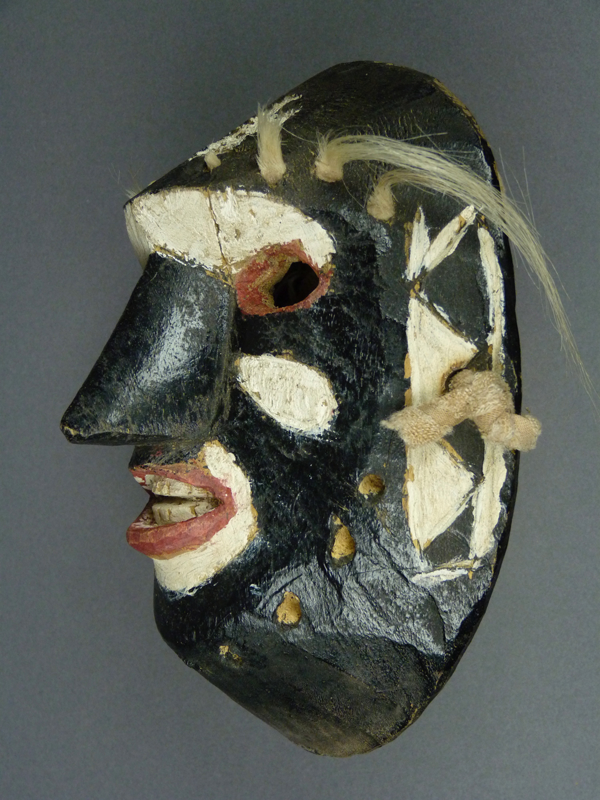 In contrast, other design details found on Rio Maya masks tend to be generic, widely used by various carvers. Pancho favors this almond shape for the designs flanking the nose, but, as you will have noticed in this post and the one from September 10, he uses other designs that are very popular among other artists. Likewise Rio Mayo mouths can be oval like this one, flat on top, sharp at the corners, or even turned up at those corners, while eyes can be almond shaped , oval, or triangular. Noses are frequently the most diagnostic element. 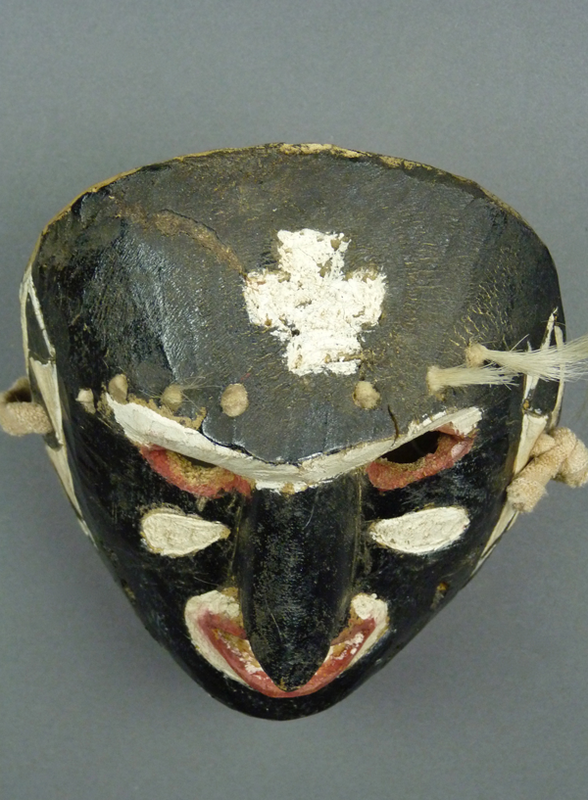 The forehead cross on this mask is the one usually seen on Pancho’s masks, essentially a Maltese cross shape that is recessed. However many of his crosses are augmented with glass or plastic jewels that obscure the original design. “Silver” paint (probably aluminum roofing paint, a product that was introduced in the United States in the 1930s) became popular on Rio Mayo masks, most of all on the masks of Pancho Parra and Bonifacio Balmea Sauzemea, apparently by the 1960s. 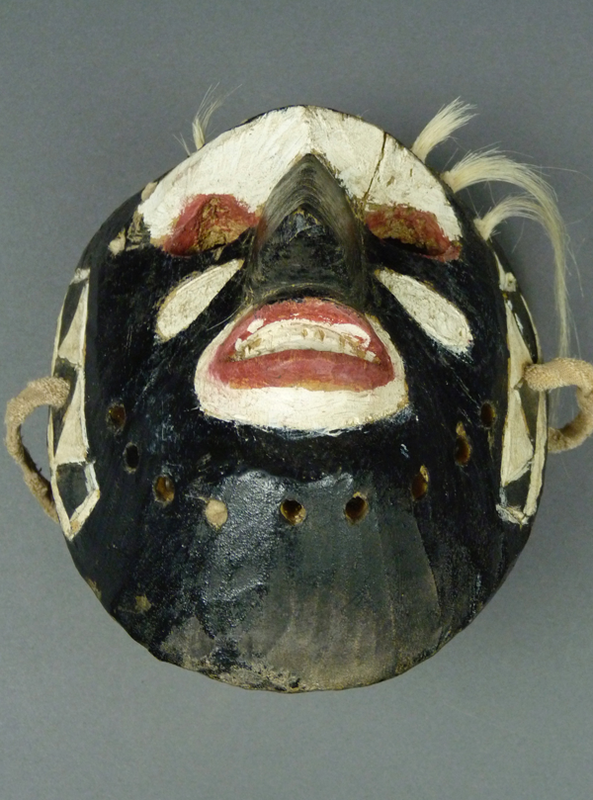 This mask is 7 ¼ inches tall, 5 inches wide, and 3½ inched deep. The back of this mask has marked staining from long use. 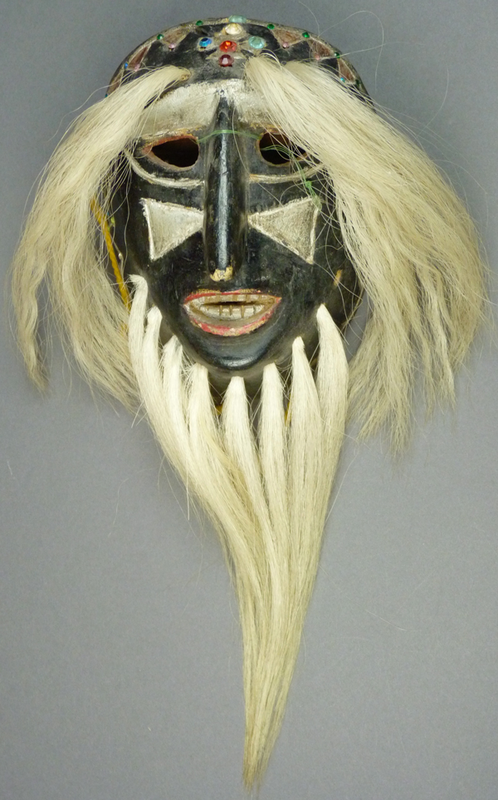 The second of these masks was estimated to have been made in the latter 1960s. 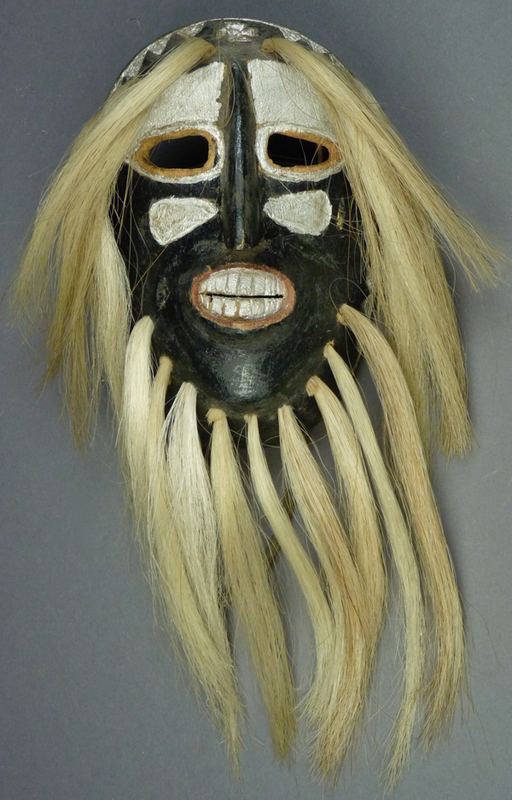 The nose on this mask is very like the one on the first of last week’s masks (a very mild curve). However the rim design is distinctly different, in that it is colored on top and simply outlined on the sides, although the inlaid jewels march right around from the top to the ends of the rim design. 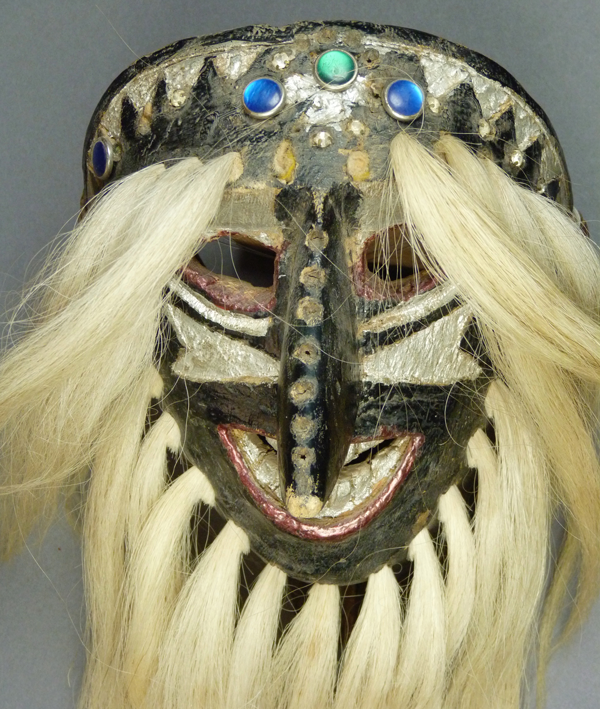 This mask is 7 3/8 inches tall, 5 3/8 inches wide, and 4 inches deep. Here is another remarkably dark back. The third Pancho Parra Pascola mask had lost its tag, so it came with little provenance. The paint is checked from age and exposure to the air. 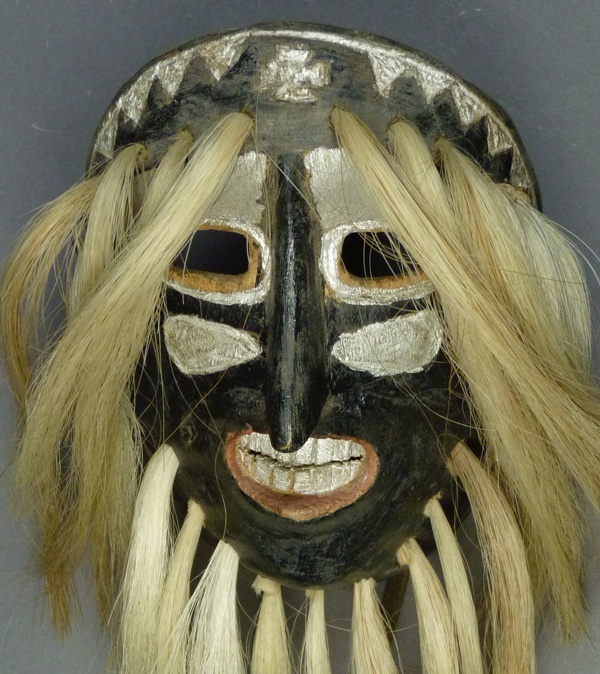 I think this mask dates to c. 1960 or earlier. It has a jaunty expression. 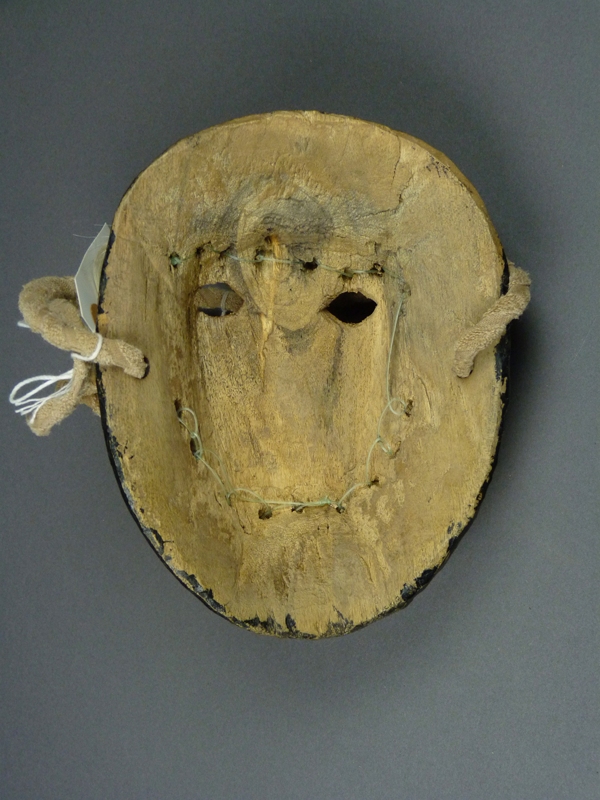 By now you can recognize that this nose design is so typical for this carver. We see evidence of many lost jewels along the ridge of the nose. The design elements flanking the nose are more dramatically shaped chevrons, a Rio Mayo standard design. I like the colored buttons on the top of the mask. The red lips remind me again of nail polish rather than paint. The curved smiling teeth are unique! 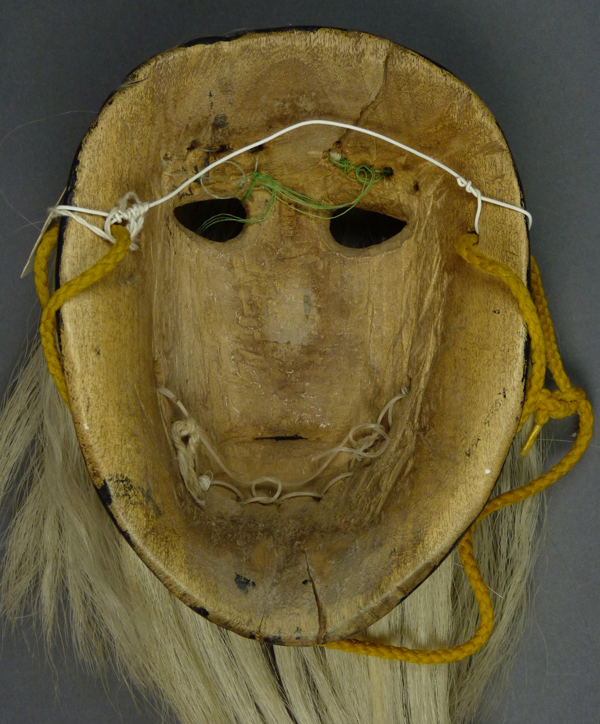 This mask is 7¼ inches tall, 6½ inches wide, and 3½ inches deep. We end with yet another beautiful back, and a worn leather strap. 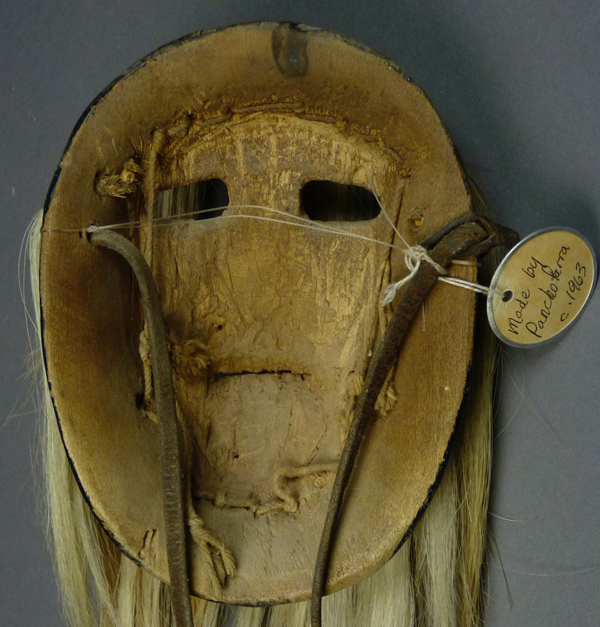 At the end, here is what appears to be a slightly smaller Pascola mask by Pancho Parra, from the collection of Barney Burns and Mahina Drees. I took these photos with the permission of Mahina in 2016. 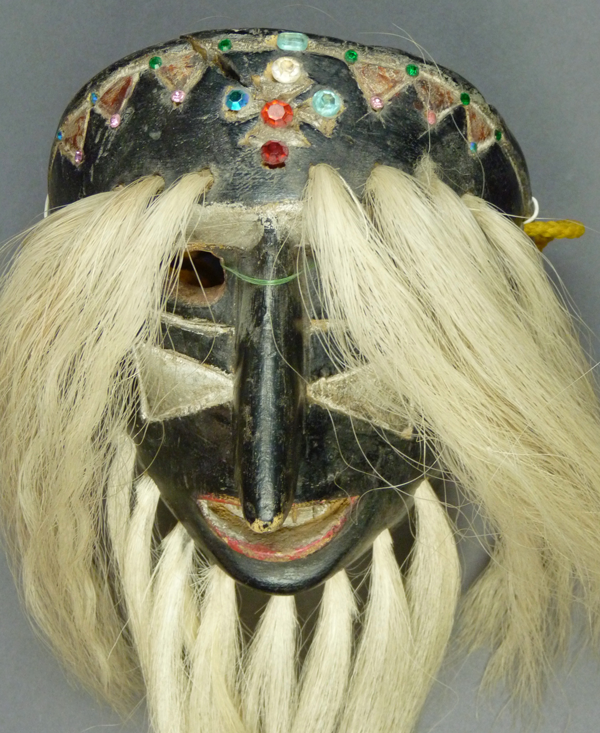 I include it because it makes one think of some of the masks by Bonifacio Balmea Sauzemea that I will show you next week. The noses are just a little different. 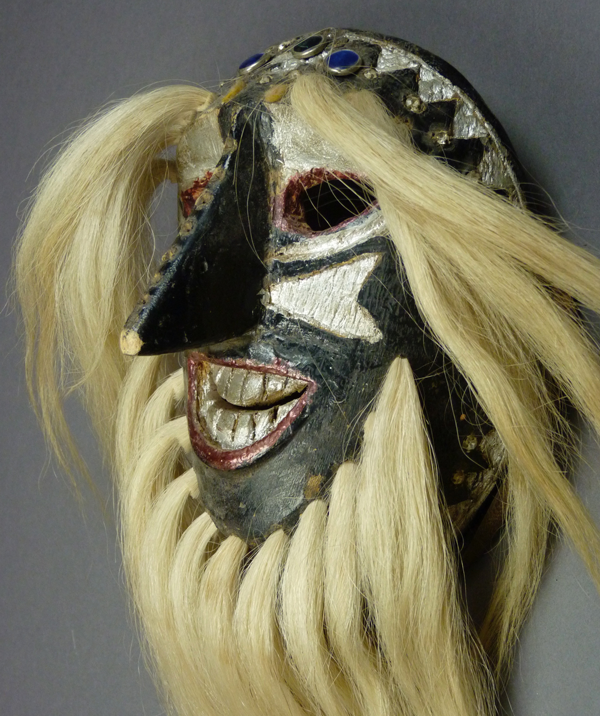 This one was collected as a mask by Pancho, from El Retiro, Sonora. It was danced for five years, and the date of collection was not recorded. 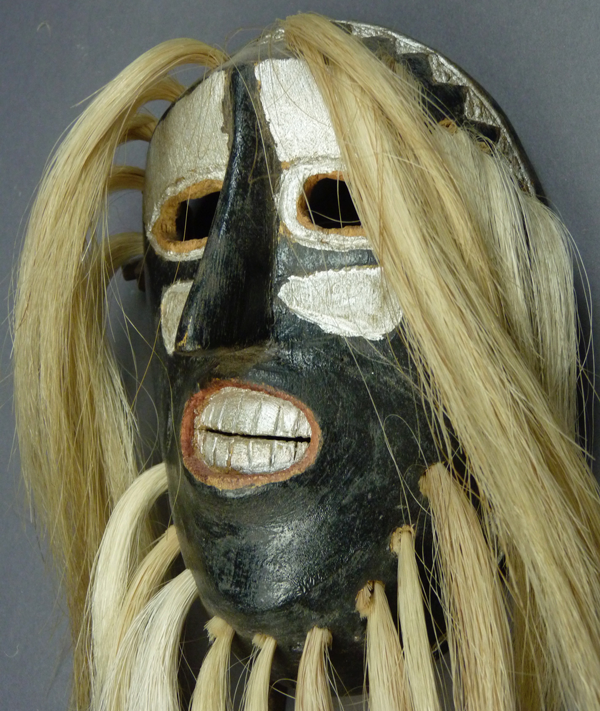 One immediately notices that the nose is very short, and the top does not reach the top of the mask. Nor does the nose taper. The designs flanking the nose are as informal and lopsided as usual for Pancho. In profile, the nose looks very much like Pancho’s other noses, although it is shorter and interfaces with the forehead at a lower level. The discontinuous border design, which has been sloppily repainted, is otherwise typical. The forehead cross has its usual shape. It may be recessed, although this is difficult to assess. At any rate it has been very badly repainted. 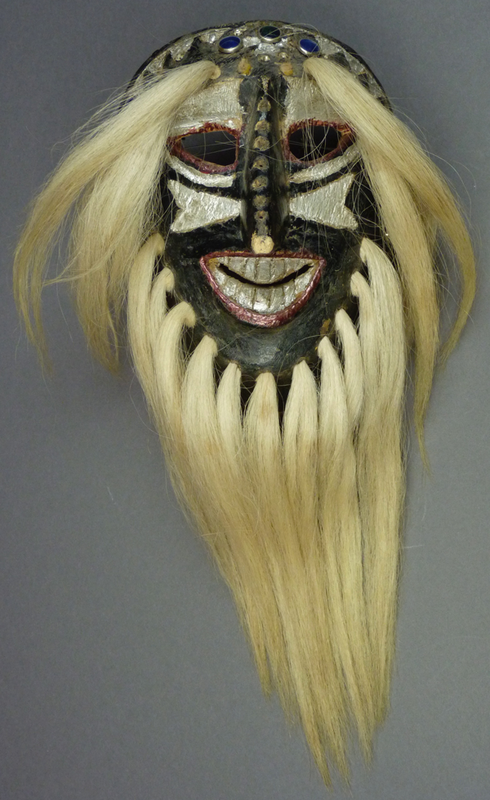 This mask is 6¾ inches tall, 5¼ inches wide, and 3¼ inches deep. The back of this mask is darkly stained from use. 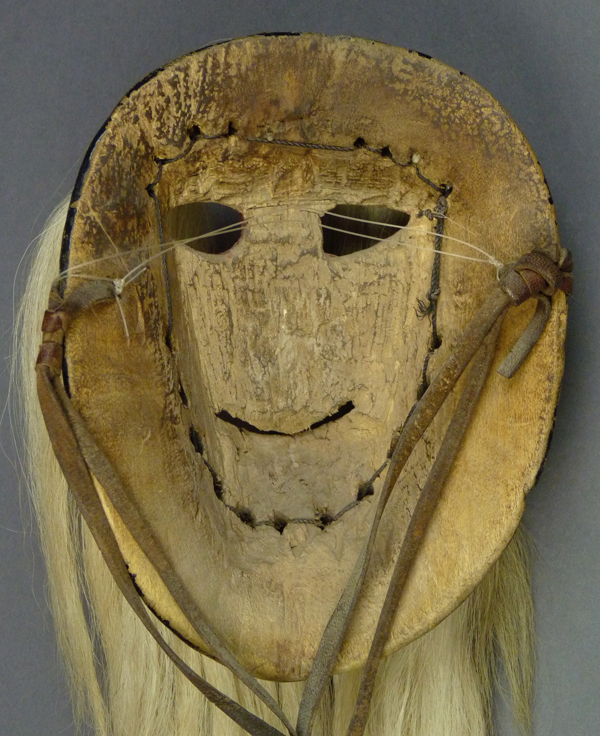 I hope that you have enjoyed seeing the masks of Pancho Parra. Next week I will follow his terrific masks with those of Bonifacio Balmea Sauzemea.